Luleå University Reception Committee (LURC) is a student organization responsible for taking care of all exchange students coming to Luleå University of Technology (LTU). We are around 12 members, all full-time students who are working voluntarily to make all exchange students feel as welcome as possible. We help with housing and introduction to the university. We also arrange welcome- and farewell dinners, trips and social activities. LURC is a local section of ESN and ESN Sweden. 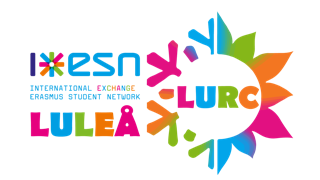 As a member of ESN we work to improve the study abroad experience in general through projects such as the ESN Survey and in Luleå in particular through our activities and close cooperation with the International Office at LTU. We also regularly meet with our sister organisations at other universities in Sweden and Europe. This also means that as an exchange student in Luleå or active in LURC you will have the possibility to go on the very popular trip ESN Sea Battle. We pick up new exchange students at the airport, administer housing, arrange an orientation period, social activities and trips throughout the year. We also give out information like maps, bus timetables and how to get around at the university and downtown Luleå. We work closely with the Student Unions and the International office and we have our own office close to them. In August about 300 new exchange students arrive and in January about 120. We also help all exchange students find a Swedish Buddy. A Buddy is a student at LTU who has volunteered to help the newly arrived exchange students.